water district at the bottom of this map. Click image to enlarge. 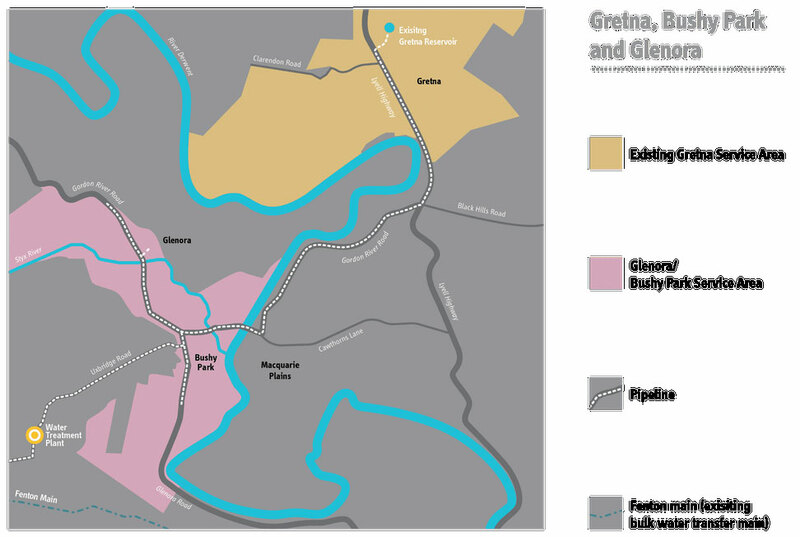 GRETNA residents are now drinking water from the Lake Fenton Line but Glenora and Bushy Park people will have to wait a few more months, a public meeting heard earlier this week. Addressing about a dozen locals and three councillors at the Glenora Online Access Centre on Wednesday night, TasWater representatives said weather and rock had delayed the installation of the water mains through the hopfield towns. 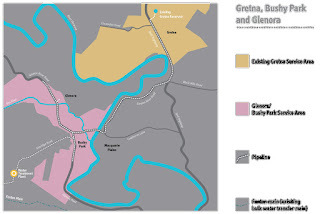 The meeting heard that water from the Lake Fenton Line was now flowing to Gretna through Bushy Park and Macquarie Plains but it had taken longer than expected to negotiate a contract for a new water treatment plant and to construct the Bushy Park and Glenora water mains. A temporary plant has been installed at Gretna to provide treated water to people there, but drinking water would not flow to the neighbouring towns until next year. With the original Christmas deadline unable to be met, TasWater now expected to be able to provide water at Bushy Park/Glenora by March or April next year. The present supply from Hop Products Australia (Bushy Park Estates) would continue until the end of June if necessary. * Despite the switch to the Lake Fenton supply, the long-standing boil-water alert at Gretna has not yet been lifted and was likely to remain in place until Christmas, TasWater said this week.